Nick Vanderpark’s empire is built on poo. Hard to pinpoint why ENVY is such a fartistic failure. The ingredients were ripe: two brilliant comic actors (Jack Black and Ben Stiller), great supporting wives (Rachel Weisz and Amy Poehler), one off-the-can comic actor (Christopher Walken), a reasonably loo-cid storyline, a recurring song evoking a Farrelly Brothers’ taint, and a scatological script – always good for a flushing laugh. 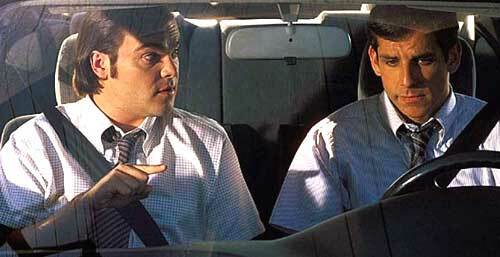 99 minutes of comedic diarrhea later, Vanderpark’s very invention leaves him neck-deep in political poo, finding the two friends on the same stool again. And us on the pot. It might have been a commentary on class warfare, on separation anxiety, on jealousy or even, uh, envy, but with Levinson’s loose direction (from a story by Steve Adams) and constipated performances, ENVY fails to make a splash. Like Vanderpark’s empire, this movie was unfortunately also built on poo. Starring: Jack Black, Ben Stiller, Christopher Walken, Rachel Weisz, Amy Poehler.